SEOmoz recently conducted a complete and comprehensive survey related to search marketing . We have selected a few questions from the survey , the data related to these questions should according to us help the people who want to take up search marketing as a full time career. We conduct SEO training and many times people want to know exact numbers and data related to their specific queries related to a career in the field of search marketing which can give them an idea about the emerging trends. This shall surely be of great help to them. 3. 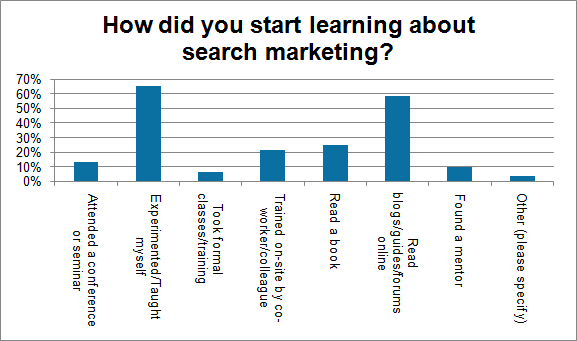 How did you start learning about search marketing? 4. Where did you get your start in the search marketing industry? 5. 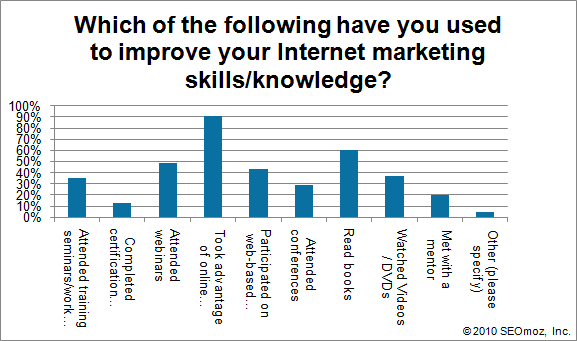 Which of the following have you used to improve your Internet marketing skills/knowledge? 6. 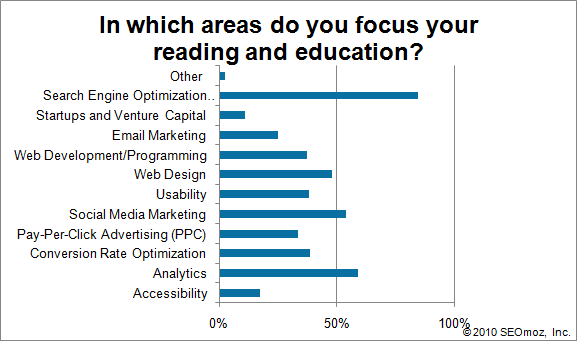 In which areas do you focus your reading and education? 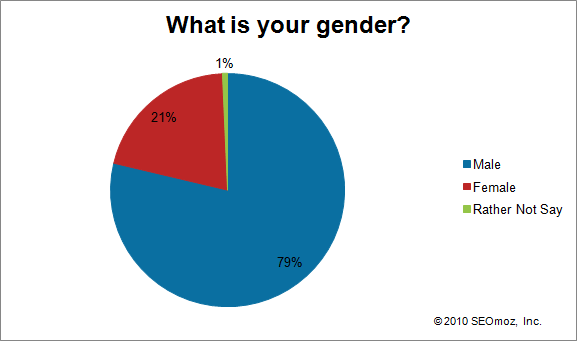 According to the survey SEO industry is also a male dominated domain with 79% of the people who took this survey were males . 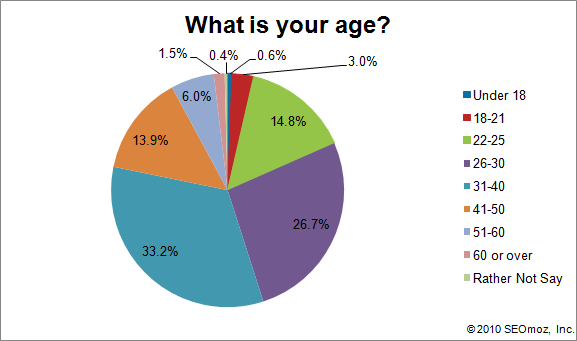 The majority of the people who took this survey are in the age group of 31- 40 . So this industry is having quite a few experienced people who have opted for being involved with search marketing after maybe weighing other career options – assuming they find this career lucrative enough . From the data regarding age we can see that there are people from the age of 22 to 50 which compromise of a sizeable number specifying the fact that many people have started taking this career at the very onset of their careers and many experienced people are also involved in this career option so the novices get to learn from the rich experience of the people in the age group of people above 35 . This is very important as one cannot survive in this field if you are not constantly learning. In this field you can keep on earning only if you can keep on learning. That is exactly what are motto at WebPro Technologies is that ‘WE DO NOT TEACH BUT WE HELP YOU TO LEARN’ we guide you to get the basics of SEO with full clarity and then we show you the methodology and the online resources from which you can keep on upgrading your knowledge related to this field as this field keeps on evolving on a continuous basis . We show you the path and instill the confidence in you and show you how to tread the path on your own. No SEO certification can make you an SEO its only your experience and the real time mistakes that you will make while optimizing the sites which shall lead you to perfection. How did you start learning about search marketing? 65% of the people said that they experimented and taught themselves. 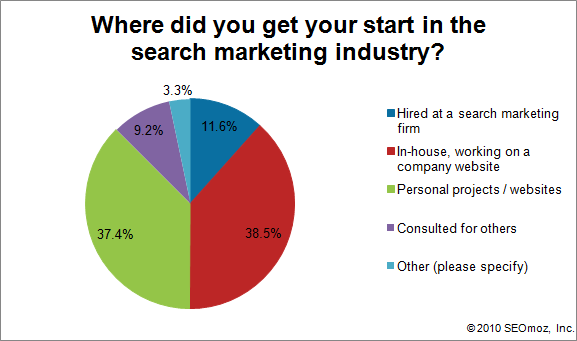 Where did you get your start in the search marketing industry? The majority of the people said they started working in-house on a company website. Once you decide to take up search marketing as a career , initially see to it that you start optimizing the websites of your friends, relatives and any other company website who wants its SEO done for free as initially the experience that you will get will be the best remuneration that you can get. Else wise you can take up a job of working as a trainee in an SEO company where initially you may have to do the mechanical and monotonous jobs related to the SEO projects but if you keep your eyes, ears and mind open you can learn a lot which can instill added confidence on working on a site individually . Which of the following have you used to improve your Internet marketing skills/knowledge? The answer is provided in the data below. There is a plethora of resources available online and offline . The next logical question is search marketing is a vast field which area are people focusing on currently? In which areas do you focus your reading and education ? The majority of the people i.e 84.3% have answered SEO and next at 58.8% is analytics with conversion rate optimization and social media marketing soon catching up. Depending on your knowledge and interest you can focus from the various options that this career offers. As it is always good to have all round knowledge but best to focus on one aspect and gain expertise on it . We thank SEOmoz for conducting such an extensive survey and sharing it with all in such detail.